Get ready for that “Push you into the back of your seat”, sound with the sonic ride the CRS8 One will take you on. 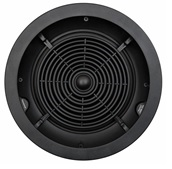 Now enjoy this popular speaker in the new Profile design good enough to even impress the interior decorator. CRS Series speakers deliver spectacular SpeakerCraft sound using the best-quality parts, the most meticulous engineering and proprietary technologies such as our WavePlane tweeter baffle for a broader, bigger sound. Profile grilles are an option on the CRS8 and CRS6 models and even on the CRS3, our tiniest and most discreet in-ceiling speaker.